A lot of you liked the Proenza Schouler PS1 Leather Pouchette I wrote about last week, but expressed some concern at being able to coordinate the color and finding enough uses for a clutch. 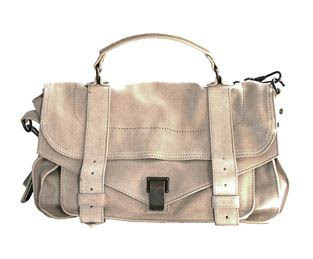 Well, since I like to be service-y, I thought I’d show you guys something that would satisfy both of those concerns: the Proenza Schouler Medium Suede PS1 Bag. I’m normally not much for off-white, but I think the color (which is referred to as “sand” on the website) is perfectly suited in this bag. It enhances the vintage feel, but the relatively clean lines of the bag’s structure give it a modern edge that keeps it from being too sloppy. The suede looks thin enough that it would slouch like a champ once broken in, and although suede is a color that can attract dirt, I almost feel like this bag would look even better once it looked a bit used. The design isn’t at all gimmicky, and nothing about this bag will look dated in a few years – in fact, I’d really love to have one, since I don’t think I’d ever get tired of it. The size also looks just about perfect for everyday use. Buy through Barney’s for $1595.